The skirt, the part of a garment such as s dress or coat that hangs freely from the waist down, can be categorized by its waist details, shape, and type of pleats. The guide below takes some of the mystery out of the many different skirt styles and types. Banded waist garments are skirts or pants that are attached to a straight waistband. 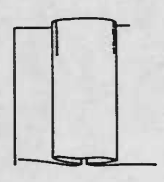 They band width may vary from narrow (3/4 inch) to wide (from 2-3 inches). 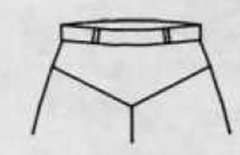 Variations include shaped or pointed waistbands. Bandless waist garments are skirts of pants with a top edge finished with a shaped facing rather than a waistband. They are also called faced or contour waists. A high rise is a very high waistband extending above the natural waist. 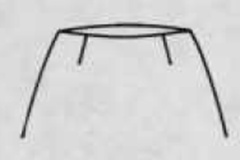 Variations may include shaping of the skirt or pant to extend above the waist. A hip hugger waist refers to the waist on skirts or pants that hangs from the upper hips. They are usually bandless. 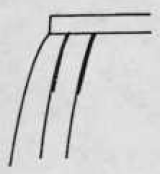 Pant variations include hipsters or low-slung pants. A pull on waist refers to the waist on skirts or pants that are elasticized. A variation of this type of waistband is the drawstring waist which uses cording to control waist fullness. 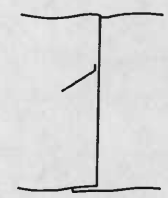 The yoke is a separate fitted section between the waist and hip. Micro-mini skirts are extremely short skits with a length less than 15 inches. Mini skirts are short skirts measuring about 15 inches from waist to hem (hem is about mid-thigh length). An above-the-knee skirt sits about 1 to 2 inches shorter than mid-knee. 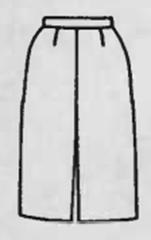 The skirt length is 21-22 inches from waist to hem or about 19-20 inches from the floor. 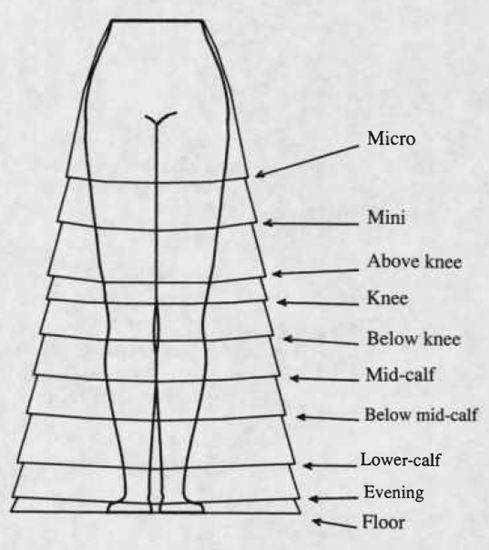 A knee length skirt measures about 23 inches from waist to hem and sits about mid-kneecap length or 18 inches from the floor. A below-the-knee skirt has a hemline about 1-3 inches below the knee. The skirt measures 24-27 inches from wait to hem or about 14-17 inches from the floor. 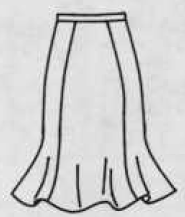 Below-the-knee skirts are also called street or cocktail length skirts. A mid-calf skirt is about 27 inches from waist to hem with a hemline located halfway between the knee and ankle (about 14 inches from the floor). Mid-calf skirts are also known as midi or ballerina length skirts. 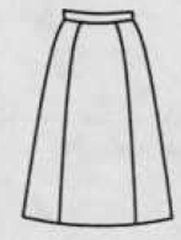 A below mid-calf skirt is about 31 inches from waist to hem or about 10 inches from the floor. They are also referred to as long skirts. A lower-calf skirt is about 33 inches from waist to hem or about 8 inches from the floor. These skirts are commonly known as long or maxi skirts. An evening length skirt is about 40 inches from waist to hem or about 1 inch from the floor. They are also called formal length or full length skirts. 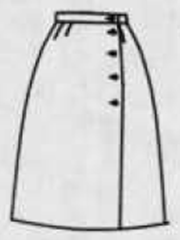 A floor length skirt is about 41 inches from waist to hem. The skirt touches the floor. An A-line skirt is fitted at the waistline with darts or pleats and has a slight flare toward the hem. 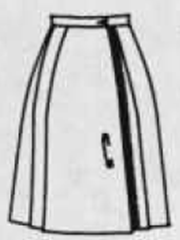 A balloon skirt is fitted at the waistline with fullness gathered into a band at the hemline. A bels skirt is slight gathered or pleated at the waistline, slightly flared and stiffene3d or supported with crinoline to form a bell shape. A bubble skirt is gathered at the waistline with fullness gathered into a band at the hemline. 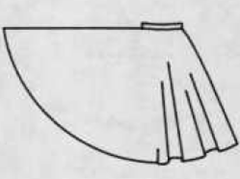 A circular skirt is a skirt cut from a half, complete, or multiple circles of fabric. They are also known as a circle skirt. 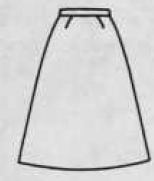 A shorter length version of the circular skirt may be called a skating skirt. 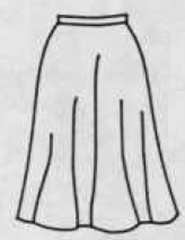 A draped skirt has additional fullness pleated, gathered, or draped on one side. They are also sometimes called saron skirts if wrapped. A flared skirt foots smoothly at the waistline but flares at the hemline. They may be cut from a quarter to half-circle of fabric. 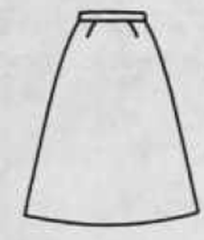 A gathered skirt is a skirt cut of a straight piece of fabric that is gathered at the waistline. The amount of fullness may vary. These skirts are also called dirndl, full skirt, or bouffant skirts. 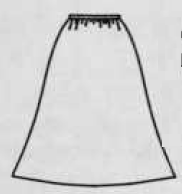 A full variation supported with crinolines or circular wires are known as hoop skirts. 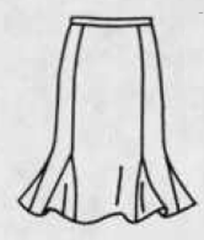 A gored skirt is a skirt with vertical seamlines. Most designs are fitted at the waist with a flare toward the hem. Gored skirts may have four, six, eight, or more gores. A godet skirt is a triangular piece set into a skirt gore seam to give added fullness to a flared hem edge. A granny skirt is a full-length gathered skirt usually with a ruffle at the hem. 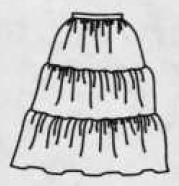 A variation called prairie skirt may be any length and have one or two ruffles at the hem. A kilt is a Scottish knife pleated skirt with a wrapped, unpleated front panel. They are fastened with leather straps and buckles or decorative pins. A panel pant skirt is a divided skirt with a free hanging panel in front and back giving the effect of a gored skirt. 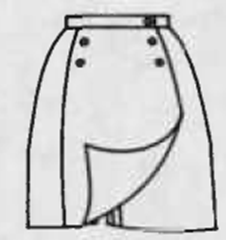 A pantskirt are pants cut to skirt length with fullness to resemble a skirt. They are also called divided skirts, culotte skirt, gaucho, or split skirt. 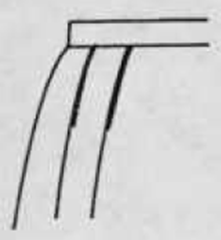 Short length versions are called scooter or skorts. A peg-top skirt is pleated, tucked, or gathered at the waist and hips but tapering to narrow at the hem. They may also be referred to as pegged skirts. 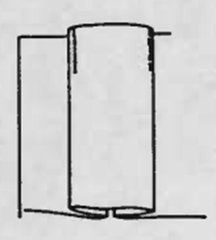 A slit skirt is a straight skirt with a vertical opening at the side, front, or back. 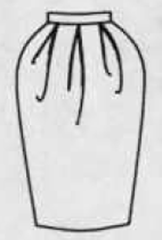 The slit may extend to the knee or thigh. A straight skirt is a slim, straight, fitted at the waist skirt with darts or pleats. This type of skirt usually has a waistband. They may also be called sheath or slim skirts. 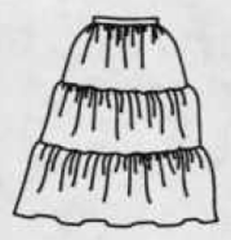 A tiered skirt is made of a series of ruffles or tiers which may be pleated, shirred, or flared with each progressively larger than the previous tier from the waist to the hem. 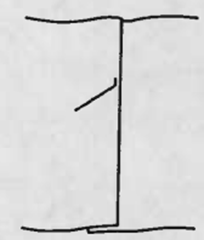 The tiers may be attached to the previous tier or attached to a base such as a straight skirt. 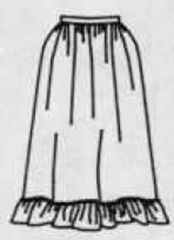 Squaw skirts typically have three tiers of tiny pleats. They are also called square dance skirts. 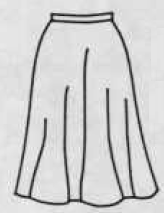 A trumpet skirt is a gored skirt that flares severely below the knees. Another variation of the trumpet skirt is the straight skirt with a circular lower section. They may also be referred to as morning glory skirts or swing skirts. A wrap is a skirt with two vertical edges open from the waist to the hem, wrapped and overlapped around the body. The skirt is fastened at the waist by ties or buttons. It may wrap across the front or the back. Pleated refers to a skirt with fullness added by one or more folds of fabric. 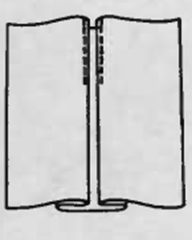 Box, inverted, and knife pleats with the folds held in pace by the waistband are called unstitched pleats, or the pleats may be held in place by edge-stitching. 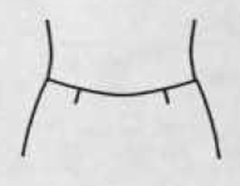 Stitching may extend to the hip or thigh. 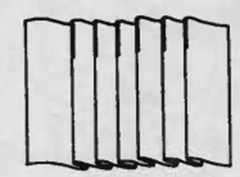 Accordion pleats are narrow pleats. 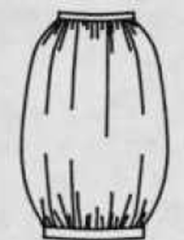 They may be pressed-in ridges or formed by edge stitching. They are also known as sunburst or crystal pleats. 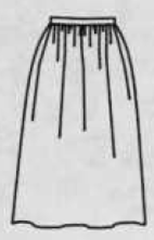 There is a wider pleat variation called an umbrella pleat. A box pleat is a double pleat formed by folds going in opposite directions. They may be single or multiple pleats. 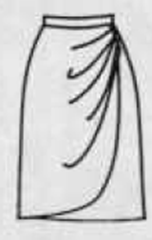 An inverted pleat is the reverse of a box pleat made by bringing two folds to a center line. They may be single or multiple pleats. A kick is a pleat in the lower portion of the garment. 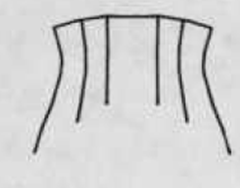 They may be box, inverted or knife pleats. A knife pleat is one or more pleats that face one direction.